It’s Halloween and two middle school boys stand in front of hundreds of suddenly sentient Gummi Bears. A few moments ago, they were in a bowl for trick-or-treaters. But a magic book from R.L. Stine has brought to life all kinds of ghosts, ghouls, witches, and monsters, from a headless horseman to a ventriloquist’s dummy named Slappy and a house-size purple spider. And now those suddenly alive Gummis are quickly changing from cute to fierce as they gnash their gummy teeth and merge together like a sugary-goo version of the mercury-steel drops of the second Terminator. “Fear,” Sarah (Madison Iseman) types into her laptop as the movie opens, and she sighs. She is a high school senior working on her application to Columbia University, trying to respond to an essay question about a fear or challenge she has overcome. At this point, it seems her biggest fears are not doing a better job on the essay and not getting into Columbia. Her boyfriend shows up at her window (the first fake-out boo-scare of the film), but Sarah’s harried single mother (Wendi McLendon-Covey) quickly sends him away. She tells Sarah she has to work double shifts at the nursing home, and needs Sarah to babysit her middle school brother Sonny (Jeremy Ray Taylor) and his best friend Sam (Caleel Harris), who is staying with them. Sonny, who is trying to finish his school project about the abandoned local Nicola Tesla electricity plant, reluctantly agrees to go along with Sam’s plan to cart away junk for free, with the hope of finding treasure they can use or sell. Their first customer sends them to a creepy abandoned house, where they find a hidden chamber with a mysterious locked book. When they open it, Slappy the dummy appears. He comes in very handy when Tommy, the local bully (Peyton Wich of “Stranger Things”) terrorizes the two boys, making Tommy's pants fall down before he can take more than the book and Sonny's sweater. Slappy also “helps” Sarah by causing her cheating boyfriend to fall off a ladder. But then Slappy decides his new “family” is not giving him what he needs, so he uses the Tesla plant to bring to life dozens of Stine characters and Halloween decorations, just in time for the trick-or-treaters to be out. Sarah, Sonny, and Sam will need to get the book back from Tommy’s house to swallow all of the monsters so they can lock them all up again. Ken Jeong is a bright spot as the next-door neighbor with a handy costume collection that will come in handy when Sarah, Sonny, and Sam have to disguise themselves. He is also way into decorating for Halloween, covering his entire house with an enormous purple balloon spider, later brought to gruesome life by Slappy. But McLendon-Covey and Chris Parnell as a monster-fied store manager are under-used and Sarah and the boys and even the bully are so thinly written that they barely register among the colorful ghosts and ghouls. This is not a film that spends time on character development or lessons learned. This is just about the boo-scares and special effects (that spider is pretty cool), the kind of silliness kids love (a skeleton dog pees on a fire hydrant), and a few self-aware references (Stine sees an “It”-style red balloon and sniffs that he thought if it first). There is that perennial kid favorite: triumph over a bully, plus a reassuring chance to out grown-up the grown-ups and rescue a mom. 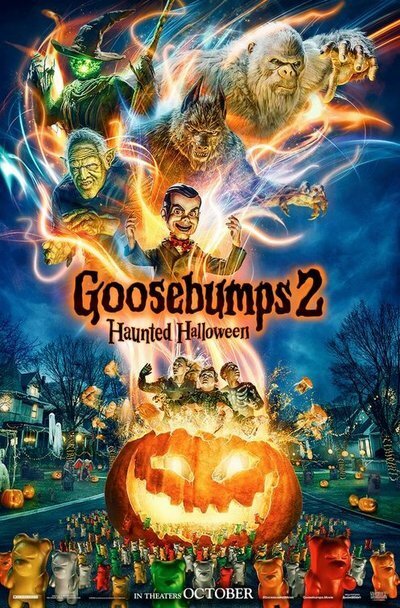 It’s not as clever or engaging as the first “Goosebumps,” and nowhere near Halloween classics like “Monster House,” “The Nightmare Before Christmas,” or “ParaNorman.” But striking the right balance of silly and scary makes it trick or treat-worthy, the cinematic equivalent of a fun-size candy bar.